This page deals with Ezion-Geber of the exodus route and Elat (Eloth) located nearby at tell el-kheleifeh. Ezion-geber is still undiscovered, but likely located under the modern ship yards of Jordan. 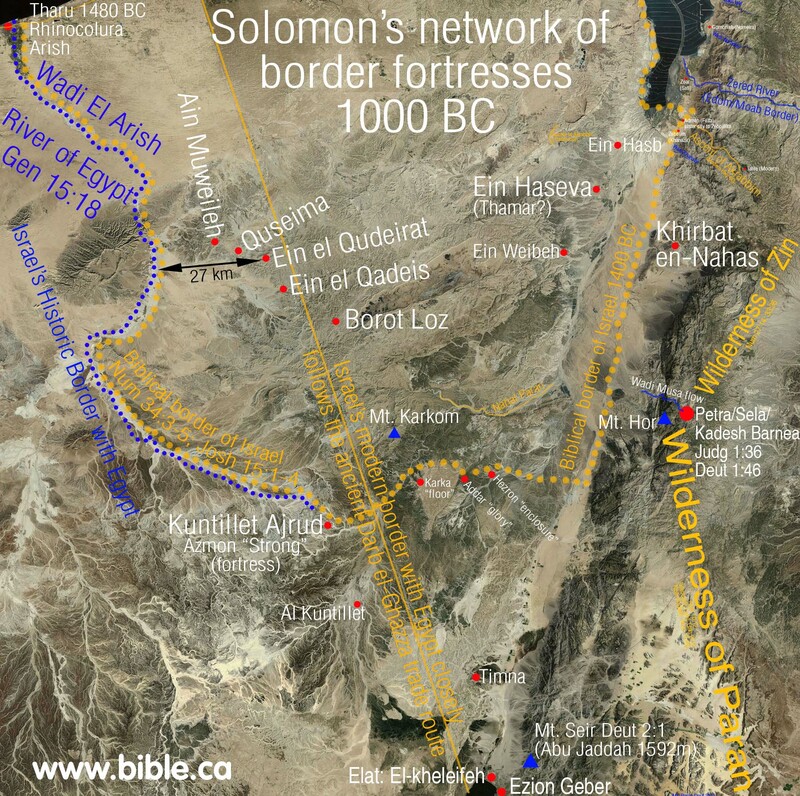 Both Elat and Ezion-Geber were two different border fortresses built by Solomon. 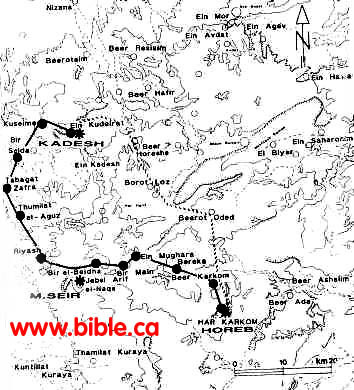 Ezion-Geber is the only "stop" of the exodus route that is known for sure where it is located. (Num 33:36) Scripture says it was located on the shore of the Red Sea, in the land of Edom, very near Elat. Both Elat and Ezion Geber are located at the north end of the Gulf of Aqaba. One of the critical factors of Ezion-Geber, is that it was one stop before the 11 day journey from Mt. Sinai to Kadesh Barnea (Deut 1:2), by way of Mt. Seir. Mt. Sinai located at Jebel Al-Lawz in modern Saudi Arabia and Kadesh Barnea located at or near Petra fits perfectly, given they would pass right by Mt. Seir, the seat of transjordan Edomite territory. 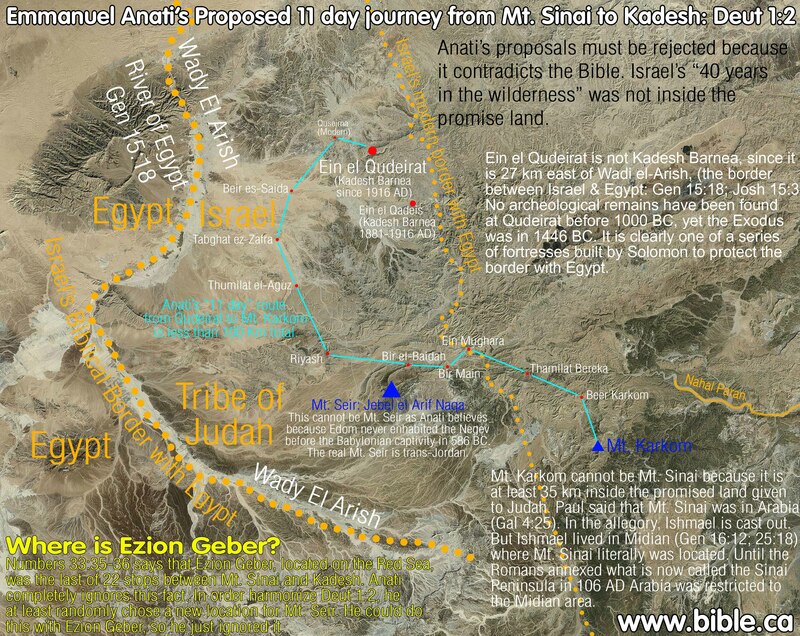 Ezion-geber, like Kadesh itself, must be on the edge of Edom's land. Archeologically, it can be proven that Edom was almost entirely transjordan until the time of the Babylonian captivity of 586 BC. This places Ezion-geber on the east side of Elat, not the west. 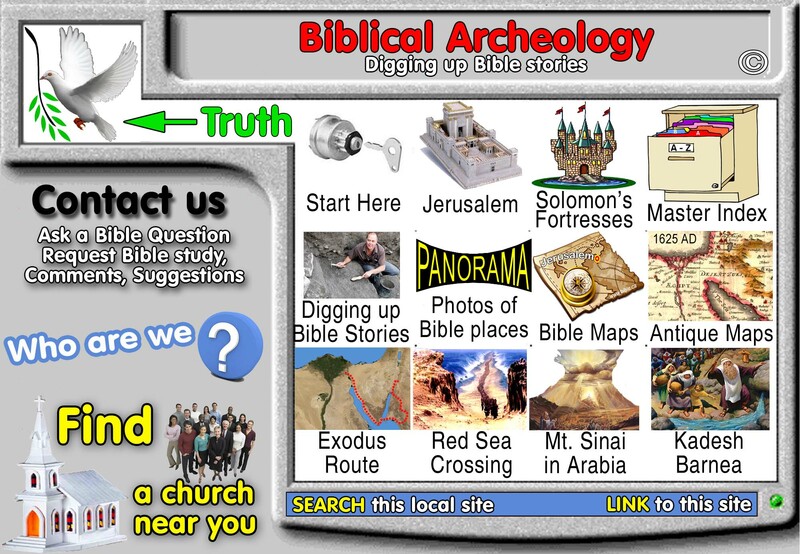 If archeologists had merely read the Bible, they would have used it as a guide to look in the right place. Tell el-kheleifeh is ancient Elat in our opinion. 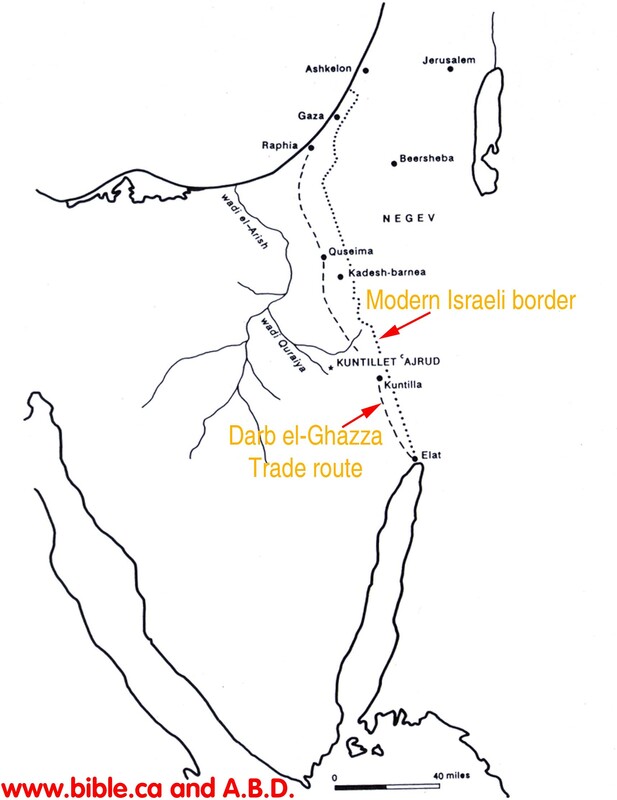 Tell el-kheleifeh cannot be Ezion Geber of the exodus Route. Biblical Ezion Geber was located around the eastern bend of the east side of the Red Sea. It is likely as yet either undiscovered, or misidentified. We take the view the Biblical Ezion Geber is under the modern port of Aqaba, Jordan and will be difficult to locate since excavations are unlikely under a fully functioning modern sea port. The modern sea port is located directly over top of the one Solomon built. 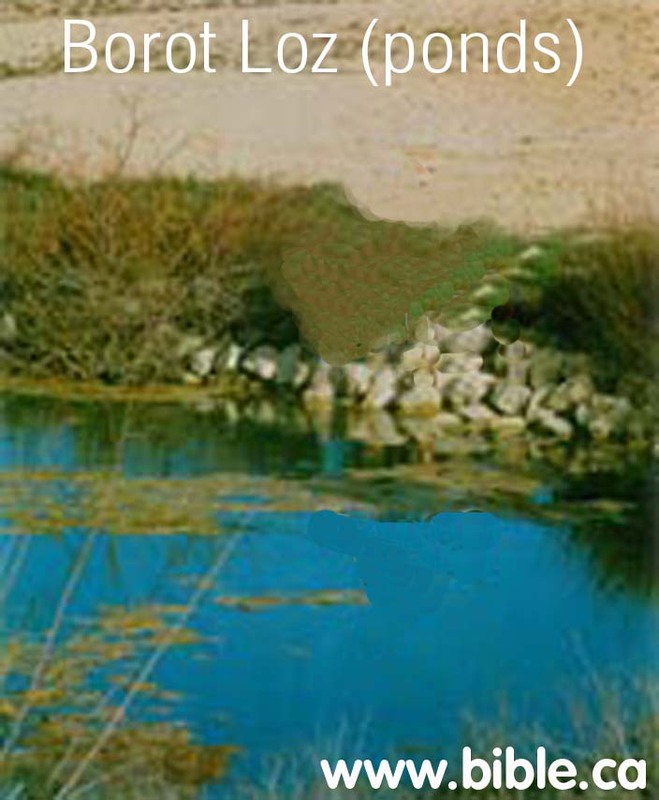 Notice that Ezion Geber is on the shore in the land of Edom: 1 Kings 9:26; 2 Chron 8:17. This means that Ezion Geber was located transjordan in modern Jordan and not in the modern Sinai Peninsula. 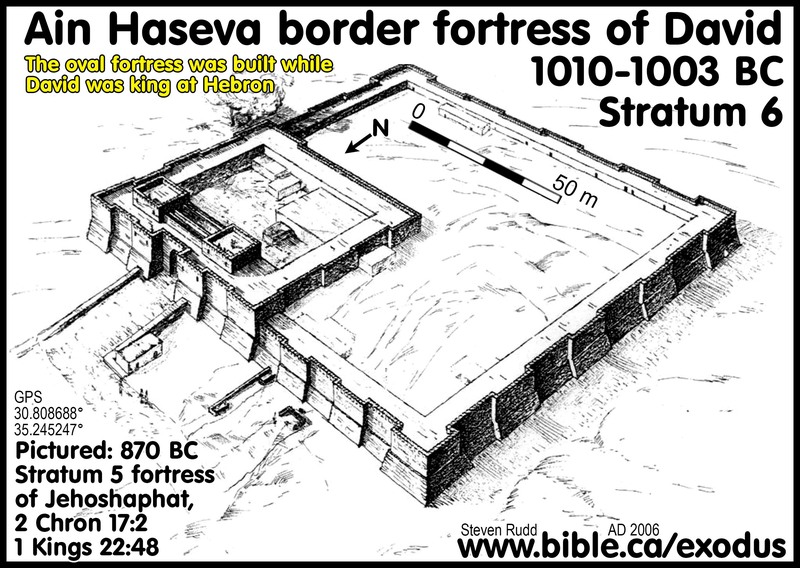 We know this, because the Edomites never lived in the Negev until after the Babylonian captivity of 586 AD. Therefore, Ezion Geber was located on the east shore of the Gulf of Aqaba. Ezion Geber is probably not discovered yet, or is under modern the city of modern Aqaba, Jordan. Clear connections have been found between Tell el-kheleifeh and Solomon's copper mines at Timna a 15 miles north, including copper fishhooks and copper slag. 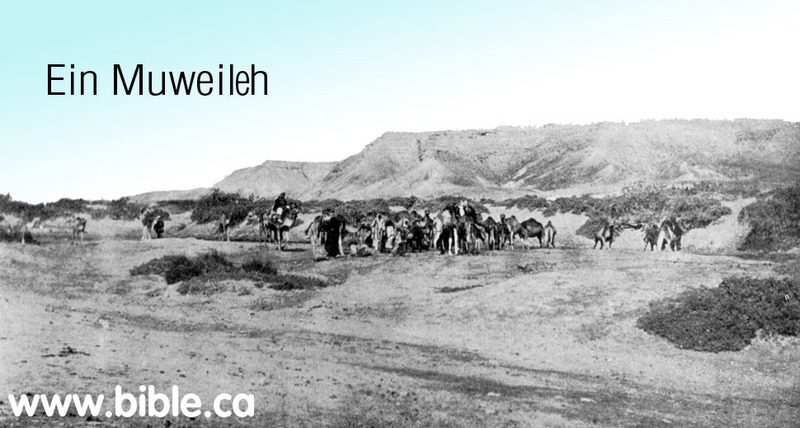 We believe Tell el-kheleifeh is ancient Elat (Eloth) which is located on the border between Israel and Jordan today, 500 meters from the shore of the Red Sea. The general location of Ezion-Geber is on the east shore of the Red Sea in Modern Jordan as indicated by the 5 possible choices on the map on the left. This is map is from the "Aqaba Special Economic Zone" Business guide printed by the Jordanian government in 2004. We believe that Solomon's fortress and sea port at Ezion-Geber is yet undiscovered, but located under the modern city of Aqaba, Jordan. Ailam (Ailath). Is situated at the extremity of Palestine between the southern desert and the Red Sea where cargo was transported by ship from both Egypt and India. A detachment of the Tenth Roman Legion is stationed there. Properly called Aila today (it was formerly pronounced Ailath) from whence the ancient people the Ailamites whose king was Chodollagomor [who is mentioned in the Acts of the Apostles]. Another Ailam of the foreigners (of Palestine) is noted in Kings. Footnote #: 6: Ailam (Ailath). Genesis 14:1; K.6:17; L. 234:75. In the Vulgate we find Ailath, Elath, and Aila for this same site. Palestine is the southern part of Syria. This word is missing in the Vatican Manuscript. Technically the southern limits of the Onomasticon should be Ailam (Ailath). 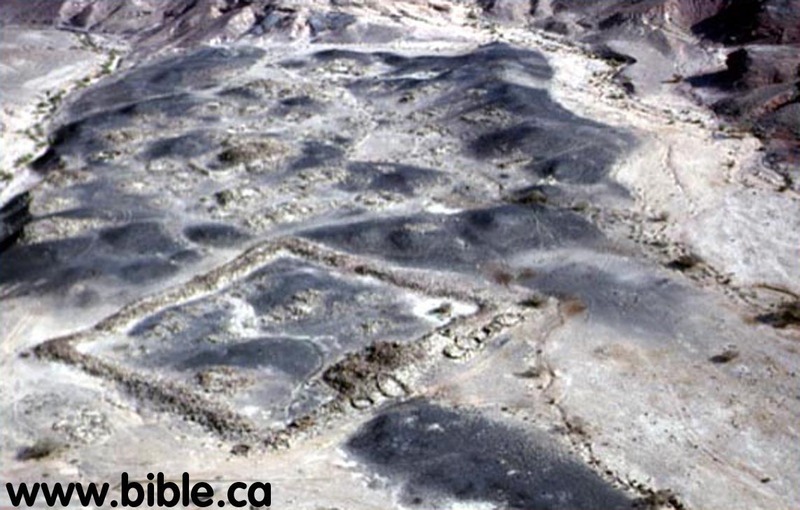 The ruins are inland about one mile from Aqabah but not as far inland as Tell el Kbeleifah which is probably the older Ezion Geber (K. 36:l, cf. K. 34:23, 62:13, Josephus Antiquities, IX, 12, 1). It was the end of the road going north to Damascus and the terminus of the overland road west to the Mediterranean. In Jerome's time it was a very busy port (Vita Hilariaris, 18, and cf. Commentary on Ezekiel 47:18). Eusebius does not indicate its size but it may be inferred that it was a polis. A bishop was present at Nicea. Eusebius uses some army source and the text is useful for noting the deployment of the Roman legion. The Tenth is located here. The Notitia Dignitatum (73:18f.) verifies this entry. The Tabula Peutinger, 820 has a Haila 83 miles from Petra and 150 miles southeast of Gaza which fits this site at el 'aqaba. The city in II Samuel 10:16 is in northeast Transjordan. The Syriac text notes it is a city of the Philistines. The Greek allophulos usually means Philistines but once or twice we cannot be positive, so in this present translation the general term "foreigners" has been preferred, especially when Jerome does not have Filistine. He has Filistine in K. 7:15, K. 21:2, K. 3:25, K. 119:3 but more often uses transliteration allofylorum (see Appendix I). All routes must run through Ezion Geber. Israel traveled from Mt. Sinai, THROUGH Ezion-Geber, passing beside Mt. Seir, en route to Kadesh Barnea: Deut 1:2. Ezion-Geber is one stop before Kadesh Barnea: Num 33:36 The only route that fits is Lawz to Petra. 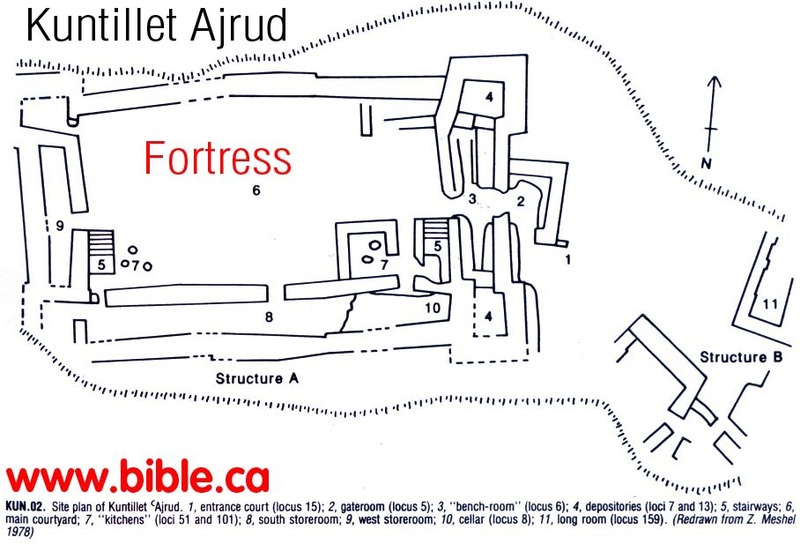 Josephus said that Kadesh was located at Petra in 110 AD. 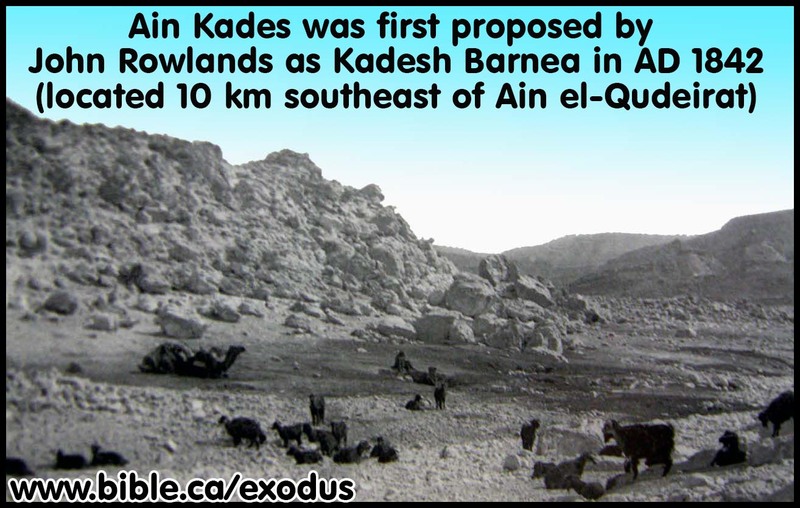 Although it is 100 km from Ezion-geber, they traveled up the Arabah Valley to get to Kadesh at Petra. Since the Arabah Valley had no towns or outstanding geologic features that the Hebrews took note of, it makes perfect sense for them to not mark any stops in the Arabah itself. We have no doubt that they made several camps as they made the 100 km journey, just that Moses didn't take note of it. The same thing happened in the route from Goshen to the crossing of the Red Sea. Moses noted only one stop between Goshen and the Red Sea: Succoth, even though it is 380 km trip. 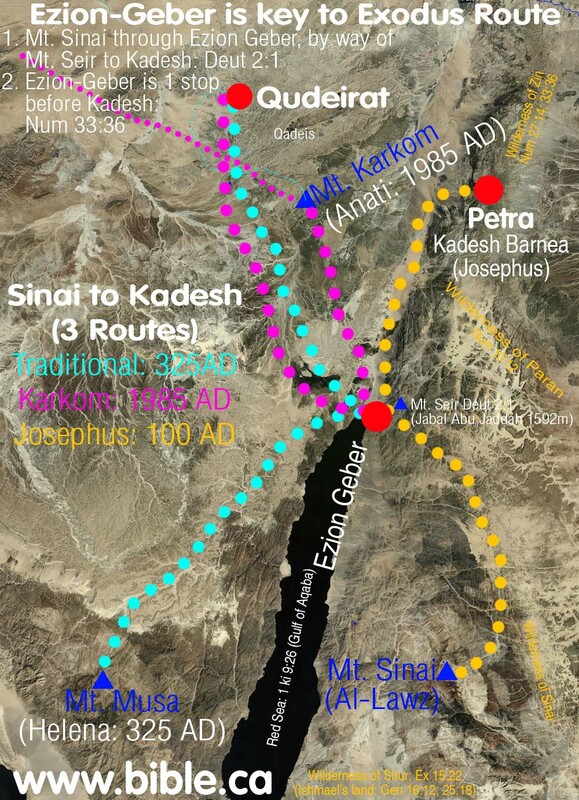 Therefore we have a precedence for why Ezion-geber could be only one stop from Petra (Kadesh) and yet be a 100 km journey. The traditional route from Mt. Sinai (Mt. Musa in the modern Sinai Peninsula) to Kadesh Barnea (Qudeirat) makes little sense, since they would not travel way out of their way, through the mountains to get to Ezion-Geber, then north to Qudeirat. They would not travel east to Ezion-geber, but north from Mt. Musa directly through the easy to travel through desert to Qudeirat. The route from Mt. Karkom to Ezion Geber to Qudeirat as impossible as it is illogical, for the simple reason that Ezion-Geber is the midpoint between the two. Emmanuel Anati, suggested and 11 day route between Mt. Karkom and Qudeirat. Click here for a map of his route. Anati also picked a location for Mt. Sier at random to make one part of Deut 2:1 fit. Of course Anati's view must be rejected because it contradicts the Bible, since does not travel through Ezion-Geber at all! Enati's route also travels from Goshen PAST Qudeirat to Karkom, then back to Qudeirat. This also makes no sense. Ezion-geber creates huge problems for the other two routes because of the mountain ranges west of Ezion-geber. For Anati's route to work, he would have to make Israel cross the same mountain range twice in the route from Karkom through Ezion-geber and then back again to Qudeirat. The traditional route from Mt. Musa through Ezion-geber, would have to cross the same mountain range. If Mt. Musa really was Mt. Sinai, as Queen Helena "saw in a vision" in 325 AD, then they certainly would never travel through Ezion-geber. The only exodus route that can harmonize an 11 day journey from Mt. Sinai through Ezion Geber to Kadesh Barnea is: Mt. Lawz in Saudi Arabia as Sinai and Kadesh near or at Petra. This fits nicely with the exodus route since Ezion Geber is a direct line path between the two. Ezion-geber is also one stop removed from Kadesh Barnea and Mt Hor. Ezion-geber is within the land of Edom. This is also near the wilderness of Zin. Mt. Hor is on the eastern transjordan mountain range that flank the Arabah Valley. M. Jezirat Faraun cannot be Ezion-Geber: Egyptian Sea port for Timna. Jezirat Faraun is an Egyptian sea port used to transport materials to and from the copper and turquoise mines at Timna. 1406-1200 BC. There was a known trade route between Timna, Elat to Egypt. It is not likely Solomon used this sea port, as it was well inside Egypt. Ezion-Geber is located on the other side of the Gulf of Aqaba, under the modern shipping docks. The same Midianite pottery was discovered here as in Timna, Al-Bad and Qurayyah where they manufactured it. The most obvious reason why Jezirat Faraun cannot be Ezion-geber, is because it contradicts the Bible which says Ezion-Geber was in the land of Edom. Edom was never anywhere near Jezirat Faraun, but on the opposite shore. Edom was transjordan from the time of the Exodus 1446 BC to the time of the Babylonian captivity. Jezirat Faraun has always been within Egyptian control even before 1446 BC. Jezirat Faraun is described as one of the best natural ports on the northern tip of the Gulf of Aqaba. Yet today it is not used as such. There are modern ports in both Elat, Israel and Aqaba, Jordan today that get along just fine weathering storms. We suspect Solomon's port of Ezion-geber, located under the modern sea ports of the Aqaba, Jordan, also weathered various weather conditions as well. 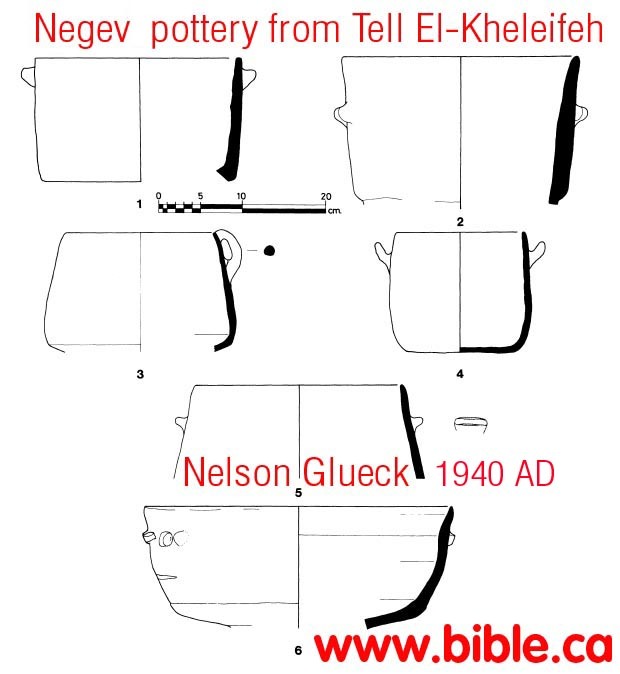 Nelson Glueck made a number of obvious errors in suggesting Tell el-Kheleifeh was Ezion-geber. Anyone who even considers the island of Jezirat Faraun as Ezion-geber are mistaken. 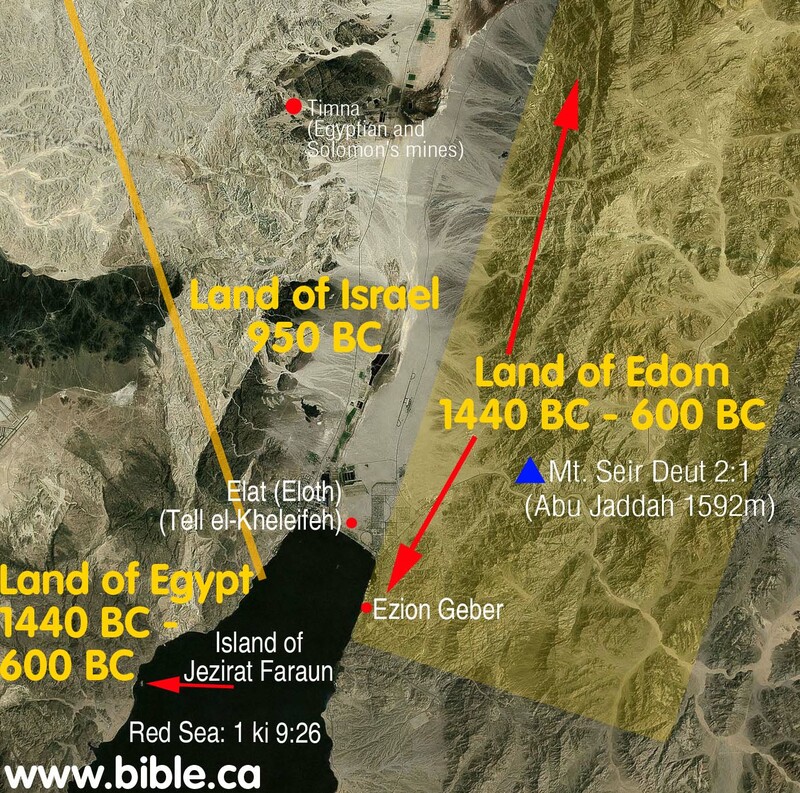 The Bible says that Ezion-Geber was in the land of Edom, not Egypt. 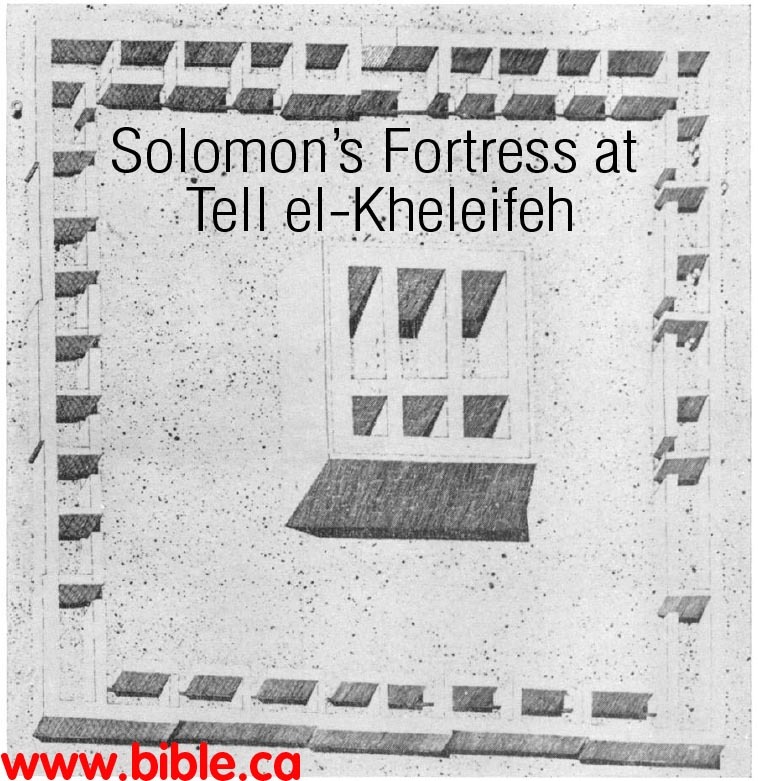 Here is what the fortress that Solomon built at Elat looked like. This is not Ezion-geber as Nelson Glueck speculated in 1938AD but Elat. 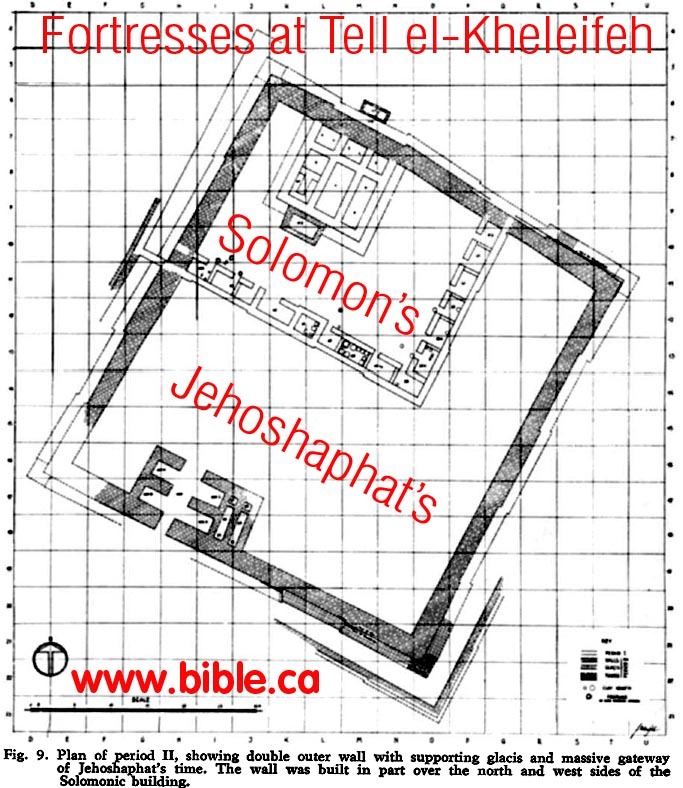 Here is an overlay of Jehoshaphat's fortress over top of the older fortress of Solomon at Elat. 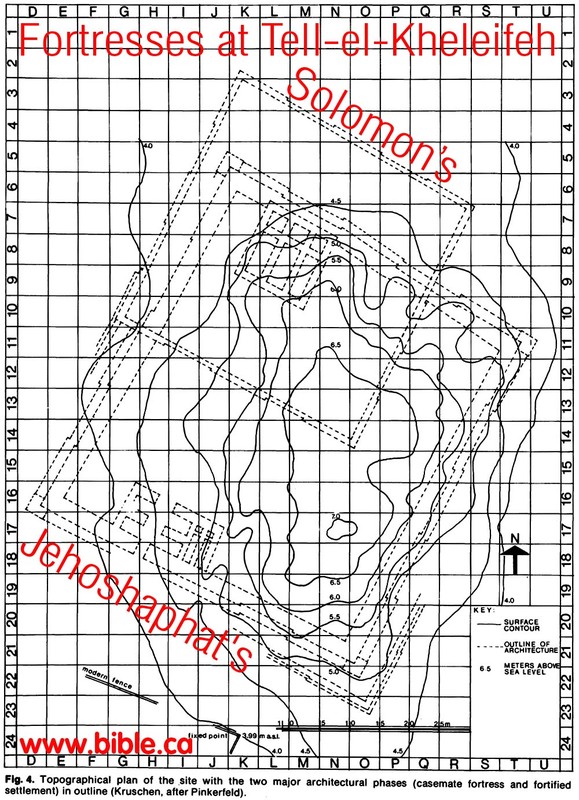 Here is a topographical map that shows of that the fortress was built on a hill 500 meters from the shore of the Red Sea less than 12 feet above current sea level. This proves sea levels have not changed much in 3000 years. 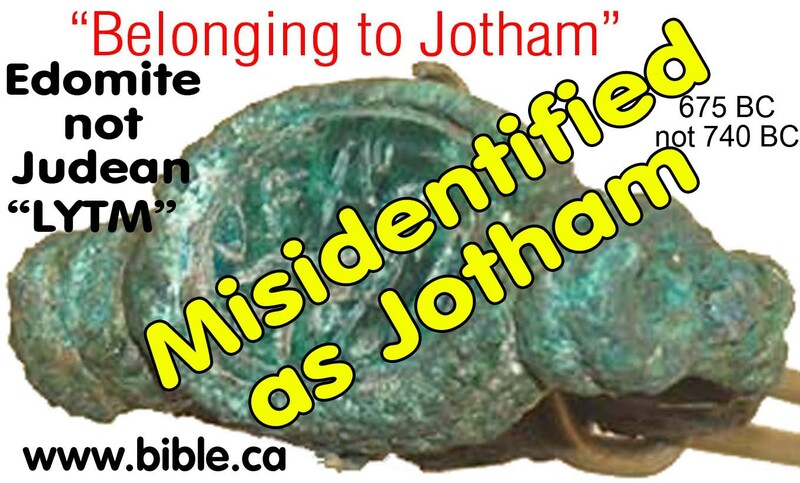 The ring is now known to be Edomite not Judean. Also found here was an Edomite inscription reading: "Belonging to Qausanal, the servant of the king"
We have can use the archeological site of El-kheleifeh which was ancient Elat, (1000 BC) to determine sea levels have really not changed much in 3000 years. From the topographical map of Tell el-kheleifeh, we can see that the structure is built lower than the 4 meters above sea level only 500 meters from the shore of the Red Sea. This is not ancient Ezion Geber, so it was not built on the shore line, but it is so close and so close to sea level, that we can be quite certain that sea level was not much higher than we see it today. Sure the level of the fresh water sea of Galilee and the Dead Sea are much lower today than what they were in the first century, but that is because it hardly rains any more in Israel. Israel was once a natural oasis of plush greenery. That is why it was called the land of Milk (grasslands) and honey (flowers). This means that the sea level was about as we see it today. This reinforces our view that Pi Hahiroth "mouth of water" was named after a geologic feature that today (and in 1406 BC), looks like a "mouth". However, we still must take erosion into account. In 1940 AD, Glueck misinterpreted round cavities in the walls as furnace flues for smelting copper. In 1965 AD, we correctly understood these to be where support timbers were placed in the wall for structural support. After 2500 years, the wood had disolved leaving round holes in the wall that looked like air ducts for the furnaces. Having said this, there are still clear signs of copper smelting and connections with Timna, just on a much smaller scale than what Glueck originally thought.